Yes, yes, I know -- spidermanspidermanspidermanspiderman. I'll get to it. But my favorite movies of the week, as usual, are the small ones. Let's start with Amma Asante's Belle, a Jane Austen-ish film based on a true story. 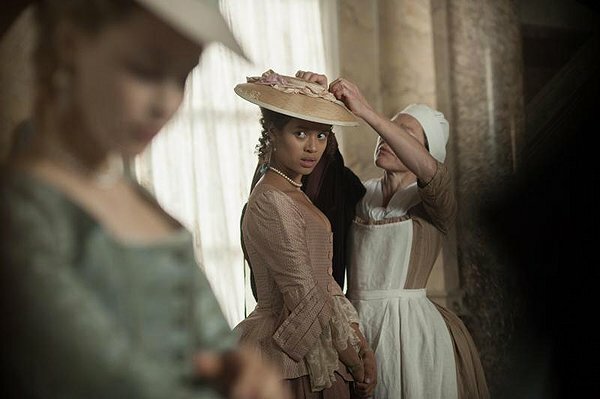 The central character is Dido Elizabeth Belle (Gugu Mbatha-Raw), the daughter of a British nobleman and a slave. Just before Dido's father leaves to meet his death in service of the royal navy, he asks his uncle, Lord Mansfield (Tom Wilkinson), to look after his daughter and bring her up as a lady. But it's the late 1700s in England and blacks are still slaves, for the most part. So while Lord and Lady Mansfield (Emily Watson) rear Dido as a lady, she is also something of an embarrassment, not allowed to dine at the table with the family when company calls. As it happens, Lord Mansfield is also England's Lord Chief Justice, and about to hear a case that will affect the future of the slave trade (which England abolished in 1807). It's a political hot potato, but Mansfield's perception of it -- his personal connection to it -- changes as he realizes the personal connection he has to it and to the idea of slaves as chattel. There is a courtliness to this era, but a passion to Asante's story-telling. Much of that has to do with the performance by Mbatha-Raw, whose sparkling intelligence and sparks of banked fire give this character both an intellectual and emotional depth. The fine actor Wilkinson finds his character's steel, as well as his tenderness, in dealing with the great-niece he initially was ashamed of. Belle is stirring film, capable of moving you even as it gives you a new perspective from the past on an issue that continues to plague us, here in the future. I also liked Diane Kurys' For a Woman, a film from France opening in limited release (and available through Film Movement). In it, a contemporary filmmaker, dealing with the deaths of her parents, discovers a window into their past that forces her to consider them in a different way.